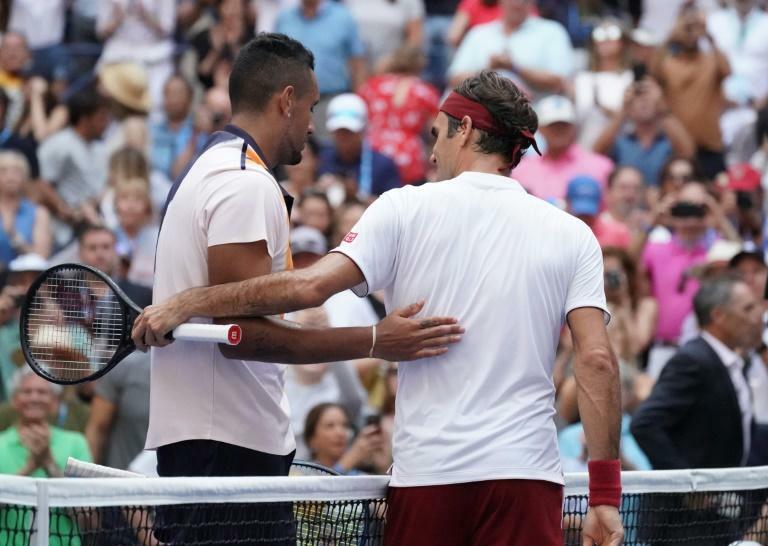 Nick Kyrgios believes he can learn from Roger Federer if he's to salvage a controversial career which has seen little return on the bags of talent at his disposal. The fiery 23-year-old Australian bowed out of the US Open on Saturday, going down 6-4, 6-1, 7-5 to 20-time major winner Federer in the third round. For many, his visit to New York this year was his tennis career in a nutshell. Exasperated by a perceived lack of effort in his second round match, umpire Mohamed Lahyani even controversially came down from his chair in a desperate attempt to get the Australian to try harder. Now, having lost for the third time to Federer, Kyrgios believes the great Swiss can steer him on the right path. "I think we're two very different characters," said Kyrgios. "But I think, you know, just the way he goes about things, I could take a leaf out of his book. "The way he behaves on court, his demeanour. He's the ultimate role model to anyone who wants to play." Saturday's defeat left Kyrgios still unable to improve on his best Grand Slam performances -- runs to the quarter-finals at Wimbledon in 2014 and last-eight in Australia in 2015. At Roland Garros and the US Open, he has never reached the second week. He still has time on his side, but he knows that the clock is ticking. "I wouldn't say I'm satisfied with my career. I think there is a lot more to be done and there is a lot more to be explored," he said. "In my career, I have been around for about four years now. I have barely done anything. I think I can do a lot more." Federer was 21 when he won his first Slam at Wimbledon in 2003 and admitted he's happy to be regarded as a role model, if not necessarily for Kyrgios. US legend John McEnroe suggested the Swiss could perform a powerful mentoring role for the combustible Kyrgios. "To play fair and play tough," said Federer on Saturday when asked what he can offer to young players. "If I can be any sort of inspiration for guys coming up on the tour, that would be great, you know, in whatever shape and form that is." Federer did have one piece of advice for Kyrgios -- sometimes it's the conservative approach that pays off and not the flashy crowd-pleasers. "Clearly when you play that way and you lose, it's always, like, you feel like he's so much to blame, but that's just how he plays," said Federer. Kyrgios counters that is the only way he knows how to approach a match. "He makes the court feel really small at times," he said of Federer. "If you're not serving well, he takes advantage of it. He was too good."